The 15th annual Renfrew Ravine Moon Festival is scheduled for September 30th, 2017. If you haven’t attended this event, you are missing out. 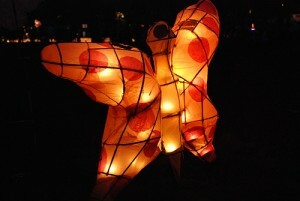 This is a great family event celebrating the environment around us with displays of colour, light and music. This year’s theme is migrations. Organizers, being the Still Moon Arts Society, would like those attending the event to reflect on the global movements that occur every day. It could be fish swimming across vast oceans, birds flying across Canada or that person travelling to meet friends or a loved on. With the issues facing the world today, movement is playing a more significant role. You are invited to come experience the installations created for this year’s event and discover your own stories in the theme of migration. The festivities begin in the afternoon with the Harvest Fair which kicks off at 4:00 pm and goes till 6:45 pm at Slocan Park. This event is a pre-cursor to the parade that happens at dusk. The Harvest Fair features games, crafts, friendly competitions, musicians, community booths and more. If you are interested in making a last minute lantern or purchasing one from a local artist before the parade, you can do so at the Harvest Fair. At approximately 6:45 pm, as the moon rises and the sun sets, musicians and dancers will lead a twilight lantern parade from Slocan Park through the Renfrew Ravine to Renfrew Park. Along the way, the procession will pass the river-stone labyrinth with candles laid throughout. Many of those in the procession are carrying lanterns and as you walk along you will see many homes on the route getting into the act with displays of light and colour on their properties that abut the Renfrew Ravine. Once at Renfrew Park, this is where some exquisite lanterns are on full display and candles set up throughout the ravine. It is quite a spectacle to see. The event finishes at 8:30 pm in Renfrew Park with choreographed dance performances, stilting and fire spinning along with swing and jazz music. The grand finale includes fireworks. This is a free all ages family friendly event.